Courtesy of athletics | Lauren Hackett, CBU alumna, spikes the ball over the net. 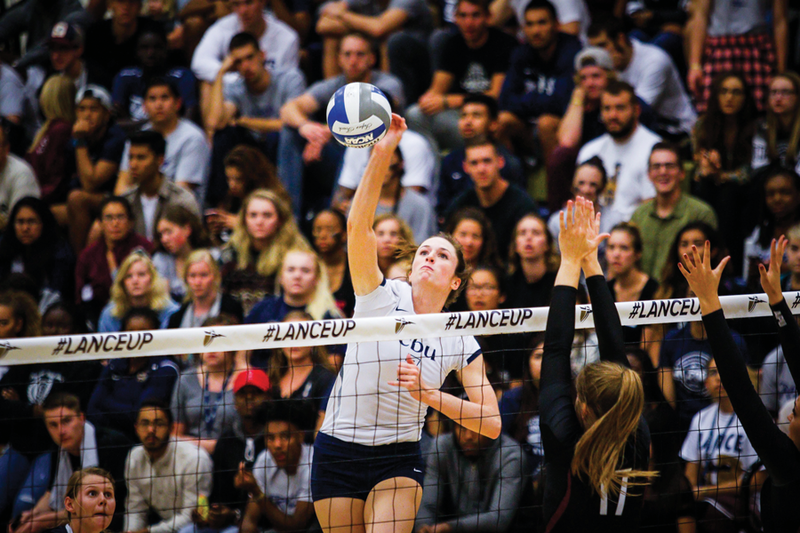 Lauren Hackett, CBU alumna, has been nominated as a top-30 finalist for the NCAA Woman of the Year award after an impressive career on the women’s volleyball team. When Hackett left the court last season, she walked away with numerous records, including a program record 1,687 kills with 892 digs and 112 aces. Hackett’s constant desire to be better and help others be- come better set her apart from a lot of athletes. Hackett’s teammates and coaches said, during her time playing at CBU, Hackett’s countless hours showed immense dedication to the game and was a great teammate on and off the court. “Lauren had a great way of connecting with people both on and off the court,” said Higa. Hackett’s teammates who still play for the team said they remember her as an outstanding role model and a welcoming personality both in and out of the locker room. “Lauren was an excellent role model spiritually and on the court. She is always picking other people up and leading by her actions,” said Syndey Marks, sophomore business administration major. Hackett, in the minds of the coaches and players, defined and exemplified what it means to be a Lancer athlete. Numerous teammates and coaches said that Hackett was a source of inspiration to them. Her impact on their playing careers resonated with many of them. “She always put God first and would try to help the dis- placed people of the world (through missions work). She really opened my eyes to how I can help and inspired me to try to go on a missions trip during my years at CBU,” said Yagoda Jedrzejczak, junior biology major. Despite all of the accolades that have been attributed to her, Hackett has maintained humility. “Lauren is an extremely humble individual. No matter the situation, Lauren always remained herself and did all she could to lead and empower those around her.” said Elizabeth Gilley, junior nursing major. Hackett now plays professionally overseas in Germany, which illustrates her work ethic and skills on and off the court.